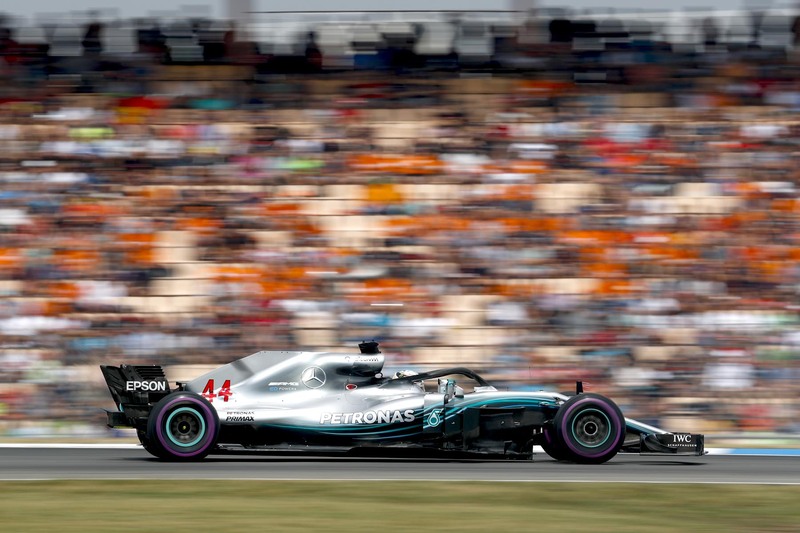 Lewis Hamilton has seized an unlikely victory at the German Grand Prix after pole-sitter Sebastian Vettel crashed out in a late-race rain shower. Ahead of him the battle began unfolding on lap 15, when Ferrari called Kimi Raikkonen into the pits from third place to change off him onto the soft tyre. He emerged just ahead of the resurgent Hamilton, preventing the Briton from benefitting from running in clear air. Verstappen was the only driver to take the bait, switching to intermediate tyres on lap 47, but the rain eased as he did so, forcing him pit again for slick tyres just two laps later — only for the rain to increase substantially two laps later. Chaos ensued, with drivers tip-toeing over the wet circuit on slick tyres. Most were told by their engineers that it would last only a few minutes and was therefore not worth stopping for, but many almost came to blows on track, desperately trying to avoid each other around the now treacherous turns.